#Giveaway --- 3 Winner OutdoorsmanLab Pop Up Beach Tent Giveaway! 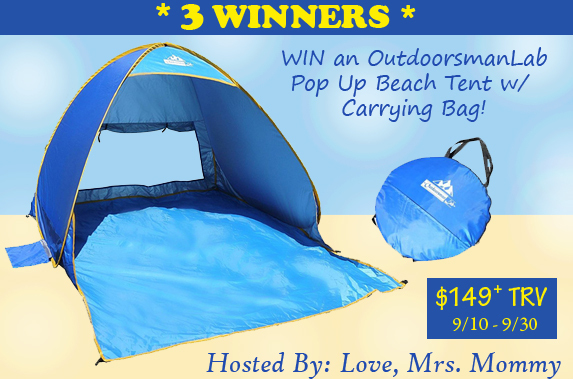 Sponsored By: OutdoorsmanLab Hosted By: Love, Mrs. Mommy Co-Hosted By: Mom To Grandma / Easter Babe's Theory / Michigan Saving and More 3 Winners will receive: An OutdoorsmanLab Automatic Pop Up Beach Tent w/ Carrying Bag ($49.99 RV)! A $149.97 TRV! OutdoorsmanLab is founded with a scientific spirit and a lofty mission: to offer innovative, well-made, and high performance outdoor gear at a revolutionary price. a dystopian thriller where Hunger Games battles the Matrix releases September 5th. Winning battles means Ink honors, prestige, and life itself. …Yet nobody understands what losing truly means. Spotlight and Giveaway for Luna Rising! Falling into Autumn Gift Guide!